The controversy of rollkur within the world of dressage is not a new one. Also called hyperflexion, it is the practice of forcefully pulling a horse’s head into an extreme low, deep and round position. Many have seen photographs of horses being pulled into such a headset, inspiring anti-rollkur websites, publications and Facebook pages. But this is not an article about the evils of rollkur, but rather the less publicly sensational but no less harmful practice of absolute elevation. When advancing up the levels in dressage, we begin at training level with the expectation that the horse must maintain himself in level balance. What this means is the hindquarters of the horse must weight themselves equal to the forehand, or front legs of the horse. For some horses, either because of strength, conformation or attitude, the achievement of level balance is one which may take some time. Then we move higher in the levels and introduce the concept of collection, which means the horse must move his center of mass increasingly toward the hindquarters and weight them further, as the forehand elevates. This becomes more and more pronounced until the horse is at Grand Prix, where a series of challenging movements test the strength of this collection mechanism. So how does this thing called collection work? Let’s start with your horse’s hindquarters and work our way forward. The idea of “getting the hindleg under” and “lowering the croup” are two concepts that are commonly bandied about in the dressage world. What happens to create and more importantly, sustain, this way of moving is actually a full body experience. To begin, the pelvis of the horse changes to improve his or her balance. While the sacrum of the horse does not have the ability to rotate, a horse’s lumbosacral joint does. This joint acts to ‘roll’ the horse’s pelvis under themselves, aiding in the compression of the hind legs (aka engagement). It might just be a little (for example in training level to achieve level balance) or it might be more extreme (for example the piaffe). This rotation of the pelvis and compression of the hind leg joints also allows the horse’s center of gravity to draw further back and away from his forehand. These mechanism do not work in a vacuum however and that full body experience we were referring to now must include to the horse’s back and abdominal muscles. Think of them as the platforms that link the horse’s front and back ends. If a horse does not have sufficient muscular strength within his midsection then there is NO WAY we can build a horse with the ability to truly collect. In addition to supporting our weight, a horse’s midsection also supports and connects the mechanisms of collection in the forehand and hindquarters. Speaking of mechanisms of collection, the next piece to the puzzle is the forehand. And yes, the forehand has a very important role to play in the collection of the horse. A horse does not have a collar bone as we humans do. Instead they have a muscular “girdle” of sorts that runs near wear the girth lays. When toned, this series of muscles, called the thoracic sling, acts along with the musculature of the neck and chest to elevate the front half of the horse. When these muscles are engaged the front limbs of the horse act to aid in his or her overall balance, pushing upward to maintain the elevated front end and encourage a rotated and engaged hind end. Just as the hind leg must rotate and compress more as collection increases, so must the front end elevate and push upward more to maintain its end of the bargain. 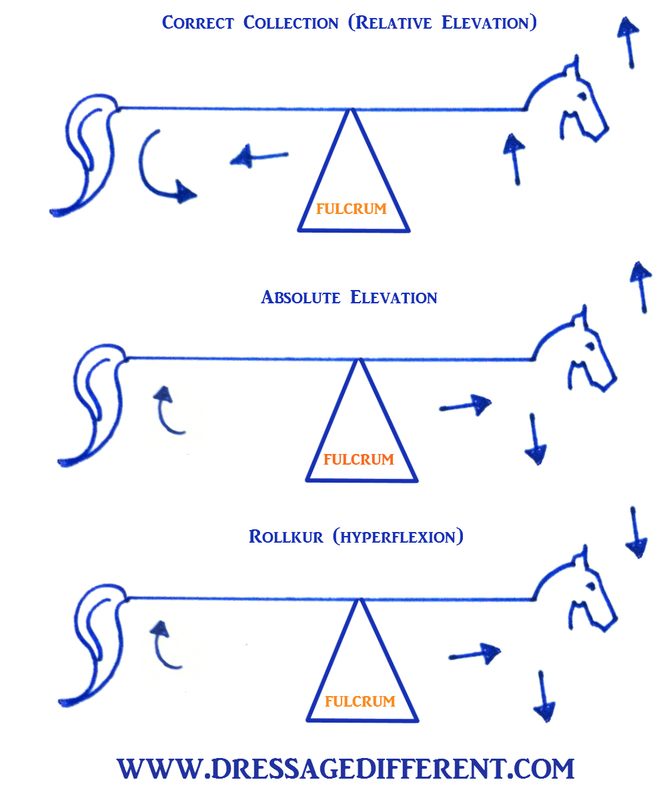 All of these body actions to combine to create a phenomenon called “relative elevation”, which is the right and proper way to strength build and collect a horse. To read more about this click here and here. This model horse nicely shows absolute elevation, with an upright next, dropped shoulders and back, and outwardly turned hind end. So now that your brains are dried husks of their former selves, how does this relate to absolute elevation and rollkur? Essentially, they are short cuts in training. No horse is meant to have their head and neck in any extreme position for an extended period of time and there will be repercussions physically if they are forced to do so. Rollkur is an extreme deep and low position, absolute elevation is an extreme high and back position. Since this is an article on absolute elevation, I will discuss mainly this, though you see in the nifty picture I drew, both absolute elevation, rollkur and relative elevation, which is the proper way of doing things. A swaybacked horse is an extreme example of what happens when the back drops. rotation and compression. So, the front end drops, the back sinks and the horse’s pelvis rolls outward instead of under. An array of tendon and joint injuries occur from this, not least of which is a phenomenon called “kissing spine”. This happens when the vertebrae of the spine are compressed together and rub on one another, bone on bone, which is extremely painful. To read more about this click here. What also suffers is the rotation of the hindquarters. If not supported by the forehand and core, a horse’s hindquarters CANNOT rotate under and compress. From the outward eye we will then see a disparity in the parallelism of the front and hind legs. Not quite parallel with a flipping toe. You will see a wildly flaying front leg with a inactive hindleg. This is because the position of the horse’s pelvis is rotated the wrong direction and so when the horse’s hindlegs step into the next stride, they are doing so at an angle that does not mirror the front and is not conducive to collection within relative elevation. Take a look at the picture examples – I tried to choose ones that are fairly subtle and not the crazy extremes. Not quite parallel but active with a rounded toe. A note: Absolute elevation is not the only reason that this disparity exists. Horses are now being bred with such a free shoulder that parallelism may not be possible in certain cases, unless the horse is kicking himself in the belly. The important thing to do is look at the overall picture, how the horse is holding his hindquarters, how he is stepping under and how the forehand is acting. Parallel with a rounded toe. Another symptom of the lack of relative elevation is the phenomenon of the ‘toe flipper’, where you see in extended trots the horse’s toe tipping upward. The function of the forehand is not being fulfilled, it is not elevated but rather slack and depressed. So for the horse to reach into the next stride they are forced to swing the hoof under and out rather than over and out. Roger? This creates the toe flipping look. If you see a lack of parallelism coupled with a flipping toe then you can bet your breeches that something isn’t quite right in the realm of relative elevation. The body of a horse is a complex mechanism, as much as ours or any other living thing. It is important to remember that correlation is not causation. Just because your horse has been diagnosed with kissing spine does not mean you are a monster. Just because there is a lack of parallelism does not necessarily mean the trainer is not correct in their methods. What you want to get comfortable with is watching how the horse’s body works, and knowing how it should correctly work. If done right, dressage will add to the strength and longevity of a horse. They will become beautiful old geldings and mares. If done incorrectly you will have a ten year old horse than rides like an old man. Correct is as correct does and the body must be build to support the balance of the level we are asking them to perform. It is when you put the cart before the horse that the horse will suffer – pun completely intended. Below is a video of Guenter Seidel and UII – watch the balance change through the body in the piaffe. Most likely, nothing at all ‘happened’ to him. His bones simply did not grow correctly. Saddleseat horses are definitely pretty, however I have seen my share of swaybacked horses and those with breathing problems. The Saddlebred folks say this is genetic but your article clearly states how this can happen from absolute elevation and being “camped out”. Luckily swayback isn’t always painful but is definitely disfiguring. Sway back is assumed to not be painful. No pain studies have been done on it. A genuine sway back would be a handicap in more advanced dressage where the back has to both lift and swing. The sway back can’t swing correctly (as expected for dressage) and obviously, it can’t lift. It’s stuck down. 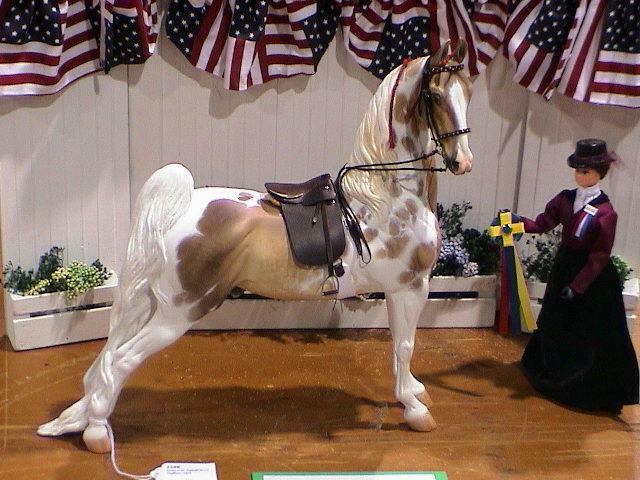 There are a few lines – very popular lines – of saddlebred that had poor backs. Ironically, a saddle seat trainer who trained Arabs told me that he refused to ride any of his ‘halter horses’ because ‘it makes their backs drop’. He also told me this was not a practice done only by him, but rather that ‘everyone does that’. And I could see the difference in the halter horses that were or weren’t ridden. In this case, some lines may have weak backs, and the style of riding may also contribute. I know an Arabian stallion that was trained as a saddle seat horse as a 2 year old. He became swaybacked young, with no conformation or recent genetic relatives to expect that he would sway. His back was, quite simply, broke. He was too young (slow maturing line to add insult to injury), pushed too hard, in to a position that proved disastrous. Luckily he is a happy 29 year old living out his days loved, and not a one of his foals has swayed. “Absolute Elevation – The Sister To Rollkur”… two ‘Ugly Sisters’? Extremes in dressage are usually ugly to someone. Going against nature is always ugly. Correct training for dressage means having an understanding of the kind of posture the horse should have and how that changes as the musculature develops during the training process. By third level, there should be so much muscle on the horse’s back that he looks like he has a mattress on his back. And yet, I have seen horses with TOO MUCH muscle on the back as well, again, caused by incorrect work. The muscles shouldn’t be hypertrophied, and they should not be so small as appear to be absent. Many people confuse fat with muscle, they’ll be happy when their horse is ’round’, but don’t realize it isn’t muscle they’re looking at, but fat. This is something I have been seeing A TON lately and I am thrilled that I am not the only one. I see a lotos horses tight in their throat latches, with big movement up front and a relatively nonexistent hind end. I am not exactly sure why this is so prevalent when we all know that isn’t correct. Bonnie does a great job explaining absolute elevation, so if you are interested in dressage I think you should really take the time to read this (and that’s why it is my first ever, Reblog!). I call this the “Black Beauty Syndrome”. The first place I look to see how a horse has been worked is bottom of the neck….I look to see if the equine has the big bulgy lower neck (undesired), instead of the nice muscle on the top (desired)…quite useful in evaluating an equine. People (trainers and their lemming clients) just don’t get it….and then they use gadgets and gimmicks and inappropriate equipment. 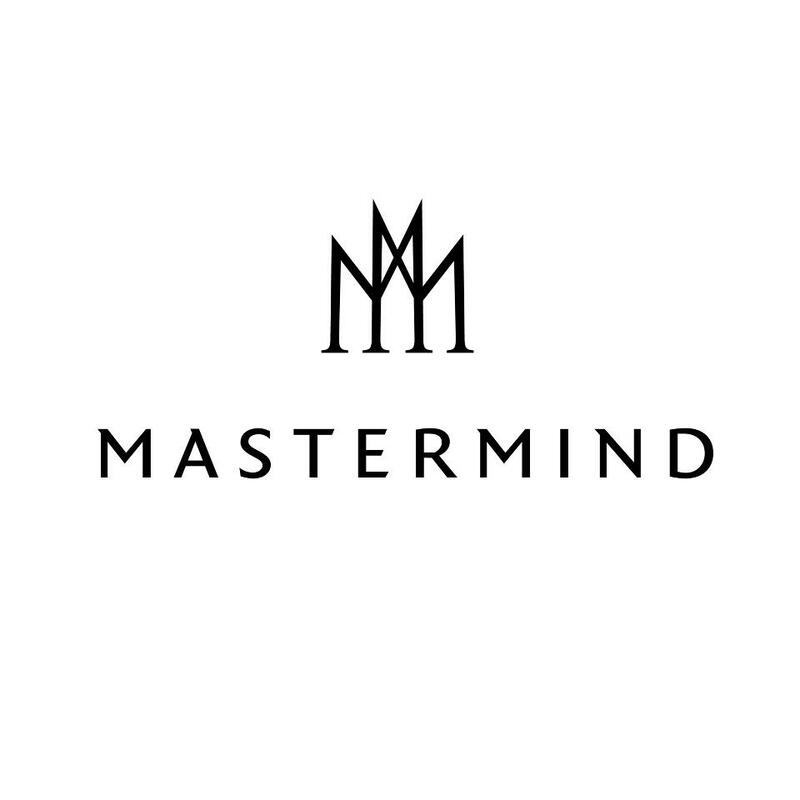 There are definitely great trainers and riders out there that have the whole picture and work with their equines accordingly; they are the minority….it is still the $$$$’s that drive even the judges, hence the consistent breakdowns seen in different breeds and disciplines. Of course, there is so much more behind my comments, including conformation, age at training, nutrition, farriery, etc. this is a great post! I really enjoyed reading it and will post a link to your blog under my article on Rollkur and collection. The example picture of the swaybacked horse is an example of extreme genetic lordosis. The University of Kentucky did a study on equine lordosis and showed through necropsy that the defect arises from a wedge shaped vertebrae in the thoracic spine. This is a genetic defect that throws the whole alignment of the rest of the vertebrae off causing the extreme swayback seen in the picture. There are different kinds if swayback and different causes. When the swayback is that severe, it is a genetic birth defect and there is no way even through proper training that this horse will ever get it’s back to look normal. I wish some people who claim to ‘cure’ such a back had your post tattooed on their forehead so their potential customers would see that disclaimer and get started running in the opposite direction! Be leary of people who claim to ‘cure’ such a condition by a few exercises, yanking on the horse’s tail, making him stretch for a treat, etc. i dont think she was saying that picture was of a horse ridden incorrectly, she said that horse pic was an exaggeration of the effects of improper training, as in its a visual overdone example for us to see what she means without missing it. Generally, ‘sway back’ of an extreme degree, has a genetic component, and what the rider does or doesn’t do, does not cause the severe type of sway back as seen in the photo. That is a born-in problem due to the bones of the back not forming correctly, due to rupture of ligaments in some cases, and rarely, to some sort of very early injury. Many saddlebred horses do have a born in back problem. And this may be exacerbated by putting the horse in an ‘inverted’ position with a head forced up high. So you may see both things at work there. Notice though, that in most cases, very little ‘force’ is used to FORCE the horse into a high head carriage with its back locked down. All it takes is just little errors here and there, or just not understanding that yu need to work the horse out to the bit, no matter whether his head is high or low. Also, don’t just head position ‘absolutely’ – meaning throw away your ruler and your protractor. The correct head position of any given horse depends somewhat on his training level, but ALSO on how he is built by nature. No, that isn’t all about where or how his neck is set. A lot of it depends on the overall balance and unity of his overall conformation, how his parts ‘fit together’, but even more, how they all work together in motion. That’s not at all easy to develop an eye for.. The ‘sway back’ that concerns the dressage rider is not the above, but the application of improper training and riding to what starts as a normal back. This is a lack of development and proper working of back muscles, and it can also develop due to an ‘inverted posture’ – the head excessively high, so the neck and shoulders are not supple, the hind quarters pushing out behind the horse and the back ‘dropped’, ie still within normal range, but not correctly lifted. You may be less confused if you use the term ‘dropped back’ for that which comes from training, and ‘sway back’ for that which is inborn. Just keep in mind that both may occur in one horse, and that a mildly sway back, or too long, weak back with a poorly developed loin, has a tendency to ‘drop’. Keep in mind that all dropped backs are not all ‘the rider’s fault’. Some horses simply do not have well made backs, but are not obviously suffering from a ‘sway back’.. There are certain…ah…’talking heads’ who make a lot of noise in dressage, who advocate the rider lifting the hand very high, and bringing the head up, saying that this causes the horse to ‘relax’ and ‘drop his head’. I am not in favor of this type of training. I feel it causes specific issues, including the ‘dropped’ back. If there is anything correct or useful in such a thing, their students seem to not be able to apply this technique and get good results. It MAY be correct for a trot (esp extended trot) to NOT be ‘parallel’. It depends on how and why it’s not parallel. Is it not parallel because the horse is being forced into a false movement in which the hind legs trail and the forelegs have an exaggerated motion due to the workings of neck and shoulder muscles, and the back is not lifted? That would be incorrect. If it not parallel because the forelegs can be lifted somewhat higher than the forelegs because the horse is absolutely straight and both hind legs provide equal power and are actually lifting the forehand, and the back is lifted and creating a correct supple bridge between forehand and hindquarter? This latter type of trot has a graceful, relaxed, supple quality, without any jerking or ‘stopping’ moments, and lacks the tension of the forced, false movement I described first. If the horse’s forelegs are higher in this sort of movement, it is the expression of the best of the long tradition of dressage – the shoulders are unburdened by correct hind quarters and straightness. This is what the old masters hoped for. It requires a well built horse with excellent natural balance, very correct riding and training, and patience. You do realize that saddlebreds and some morgans have wide shoulders, and high withers making it possible and natural for gaited breeds to have a natural high headset?